Where to start. Well. First off, my classes are going well, my students are a delight and I really do feel like I’ve noticed improvement in their English. Maybe it’s just because they’re now not as timid to speak (well, most of them) or because I actually have taught them something. But either way, it’s wonderful. It’s an amazing thing when you can teach students something one day, and then a week later ask them a question and they answer using what you taught them–and without questioning it! I love it. I love knowing that what I’m doing actually has an effect on someone. That I’m helping them in some ways. When I tell my flatmate that she just laughs and says, “Tess, that’s very spiritual of you.” But I know she feels the same way. We’re young yet, we still believe we can make a difference in peoples lives. I’m starting to feel as though many of the other teachers at the school feel a little more… disconnected. We’ve even been told, “You youngsters, you believe you can change everything. But you can’t. Don’t put too much effort into things that can’t change.” I guess, none of us “youngsters” are ready to give up yet. I spent last weekend in Rome, visiting a friend who is studying there. And my goodness! What a delightful, wonderful, fantastic trip. Seriously: the gastronomy, the city, the people, the sights, all wonderful. 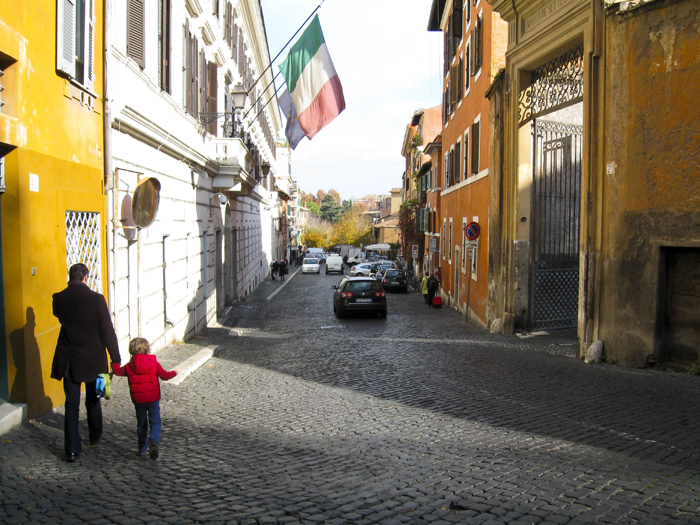 I’d been to Rome before, a long time ago so I didn’t remember everything, but I really just wanted to be on the street. To watch Rome breath, move, live. I realize it sounds a little over-the-top, and maybe it is, but that’s what I wanted. Because in Rome, no matter where you go it seems like you will always come across a monument of some sort. So I figured, if I just walked around for hours, I would find most of what I wanted to see. And so we did. I would get up at 7 a.m. in the morning and wouldn’t get back to the hostel until 12 a.m. or later at night. The whole day walking around and just being a part of the city. We also came across a fun chocolate festival in the barrio Trastevere. They had shoes made out of chocolate! Watch out Cinderella, the next remake of your story you’ll be in chocolate shoes instead of glass. We also happened to run into a good friend of mine who also, randomly, happened to be visiting Rome at the same time. What a small world. Seriously. And now it’s back to work. For at least another couple weeks before the winter holidays come and I get a little break. Well from some things. The magazine never really has a break. Not that I’m complaining, mind. On Friday I visited Sidra Piñera for HardCider. Great medium sized ciderhouse. The owner, Jose Luis, was very welcoming and had lots of good things to say–especially about the process of making Asturian cider. He and Begoña, my ciderhouse guide and new tourism friend in Gijón, go way back (their families live close to each other) so the visit it was definitely a more familial atmosphere, which was great. I really enjoyed, and appreciated, the visit. Last night Barça won the Classical game between them and Real Madrid. Great game. I stayed at home to watch it. A little sad, but I’ve been jumping here and there so often lately, I really only wanted to watch the game on my own couch, in my pj’s with a glass of wine. And of course, I wasn’t really along, because my neighbors to the other side of my apartment were watching the same game and making much more noise about it than I. So, I still sorta had the atmosphere… just a little more hidden. I’ll try to get some photos up soon of Rome and what not. But at the moment, I’m just happy I’ve sorta updated the blog. If I don’t write again before the holidays, have a wonderful holiday season.